I survived the first week of Blogmas =) You can catch up on all my Blogmas posts here. Today's outfit is perfect for a family holiday gathering. I love sporting plaid flannel shirts during the holidays and this one from Target fits the bill. Since the outfit is rather plain, I added a fur vest for dimension and visual interest. This vest was my solely purchase for the month of November. I will do a purchase recap for 2014 soon. Happy Monday, everyone! Great vest and plaid shirt! Great combo! 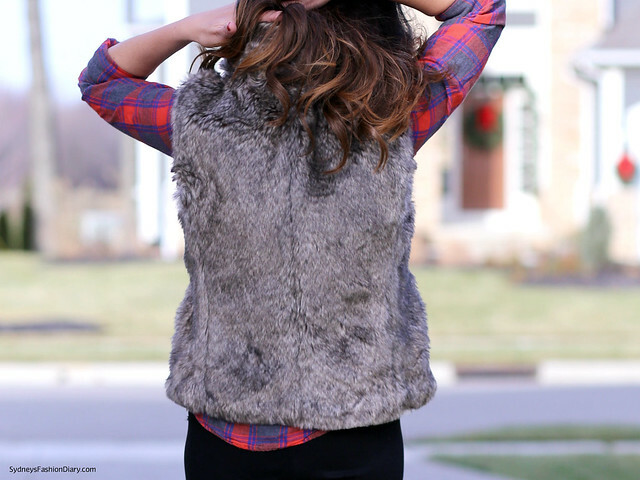 You can never go wrong with faux fur and plaid! Such a cute combo, I just love fur vests. I love the plaid and fur combo! This was basically my Thanksgiving outfit!! I went to two family members' houses and had Friendsgiving on two different days!